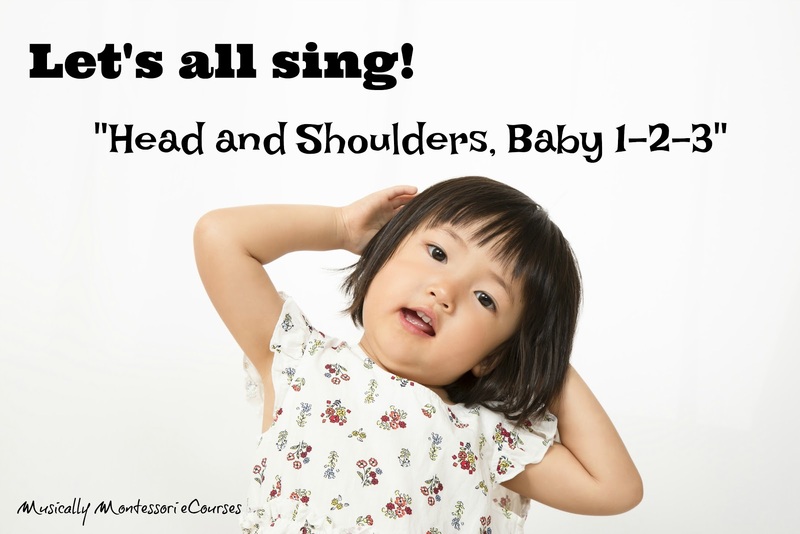 LET'S ALL SING A SONG AND THEN LET'S TAKE A BOW...FUN STUFF FOR PRESCHOOLERS! 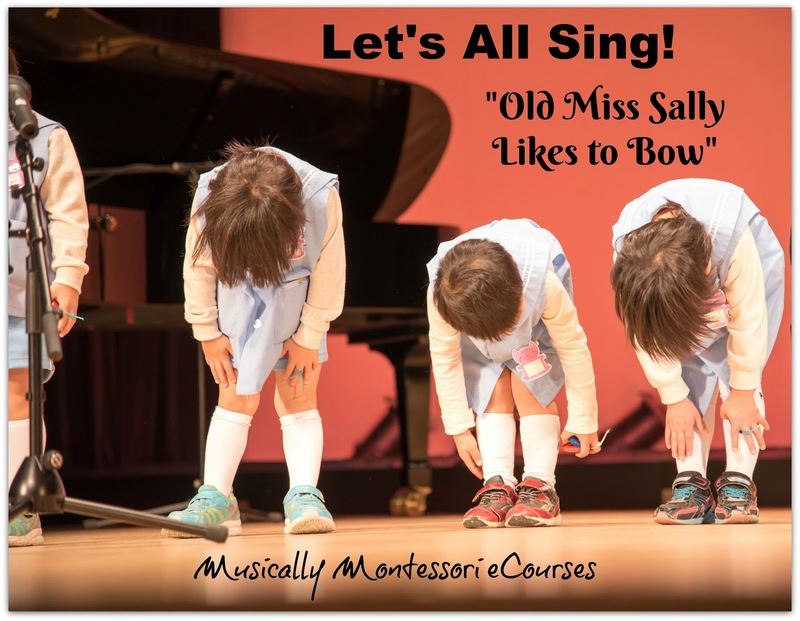 This is a traditional and simple Movement song with a catchy little theatrical "bow" at the end of each phrase. 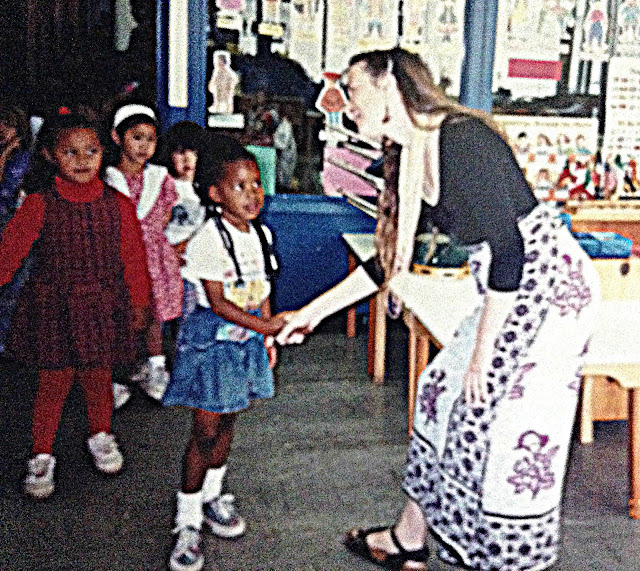 I've always loved this Activity, because it is active, yet the "bow" after each action tends to calm down the energy. 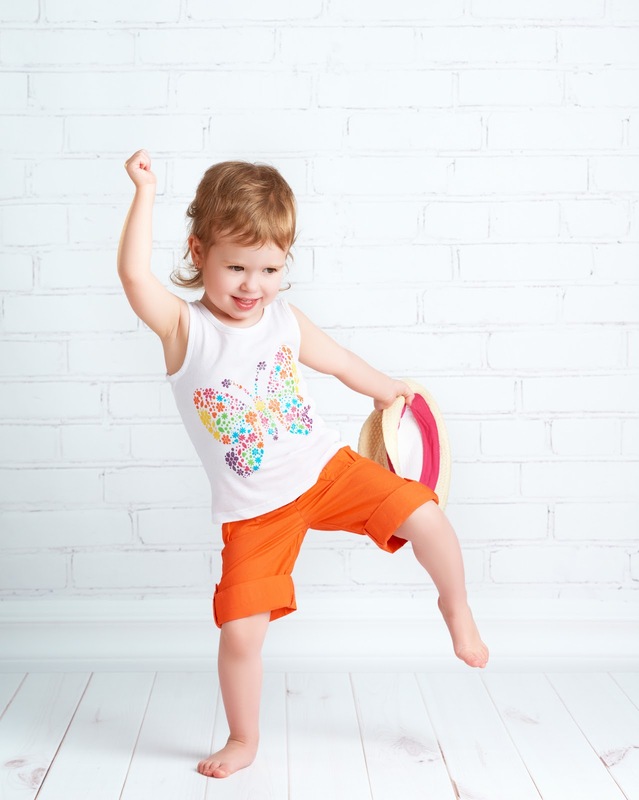 Great for teachers to not only give children opportunities to really move, but also to practice self control by reigning in the energy when taking a bow after each action. 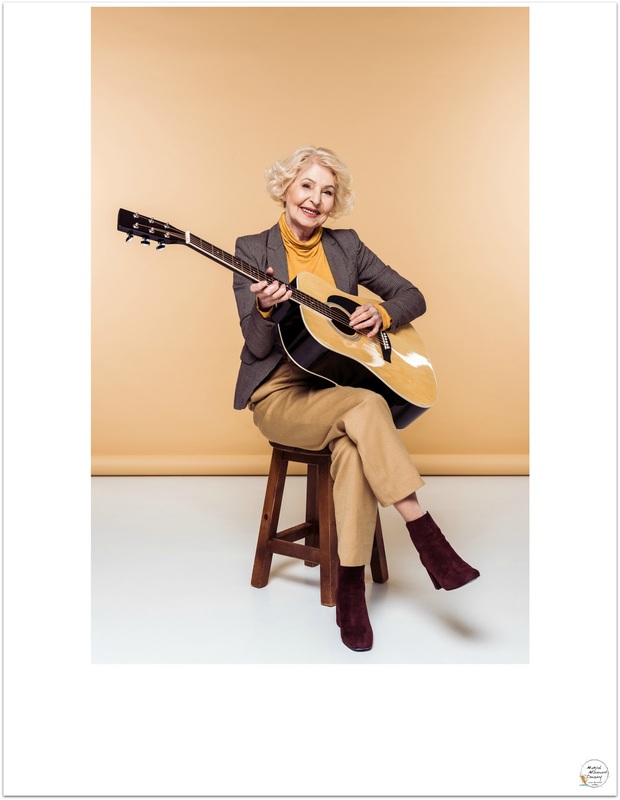 Traditionally, this song has been titled, "Old Lady Sally" and that is the way you will most likely find it being performed. 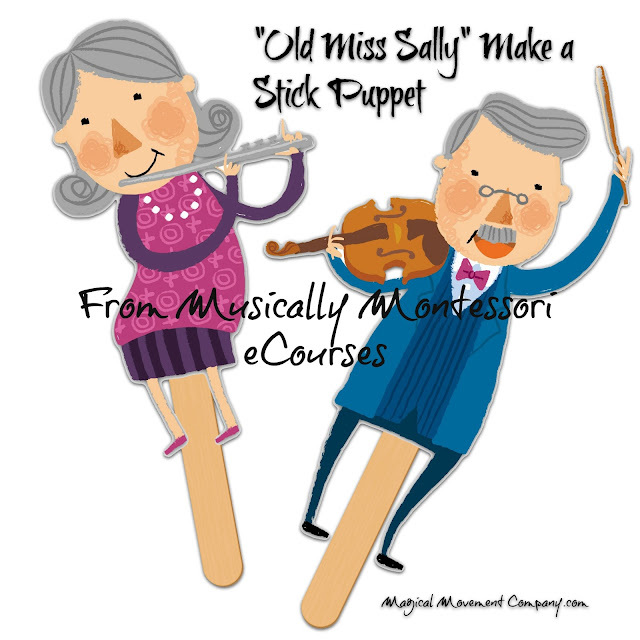 However, in the 1990's, when I was taking my Orff-Schulwerk music training, one of my teachers (Janet Greene) explained that she changed the words to "Old Miss Sally" because she thought that was a more respectful reference to the "old woman" in the song. So I have always taught this song as "Old Miss Sally" and it works nicely that way. 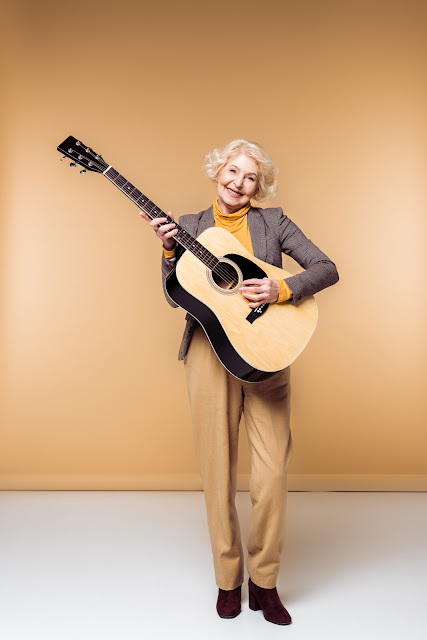 Likewise, I have prepared my materials for presenting Extensions for this wonderful musical Activity with photos of happy, healthy and active seniors to continue the respectful and more appropriate image to be portrayed in the song! This song has lots of room for participation from the children. 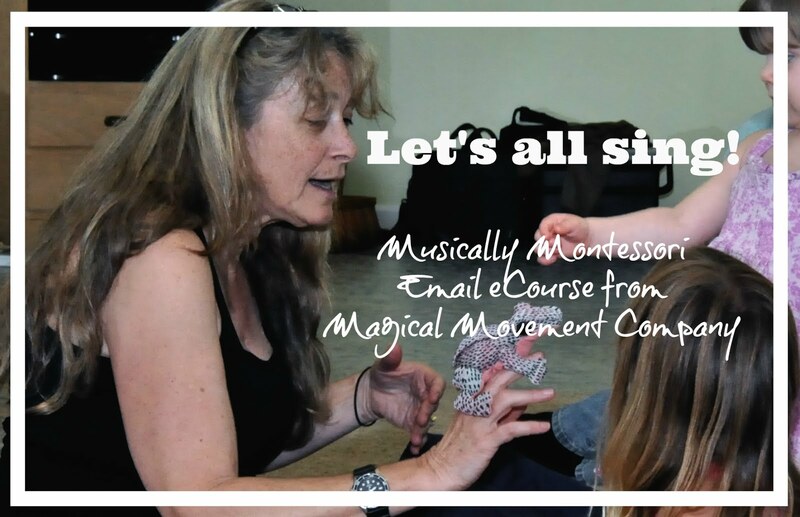 Not only are they creatively moving according to the actions being sung about, they can also suggest the actions themselves! Working with the muscles of the body AND the brain! And, we all know that songs with repetitive refrains (ex: "And, Old Miss Sally likes to bow!") aid in cognitive skills development. 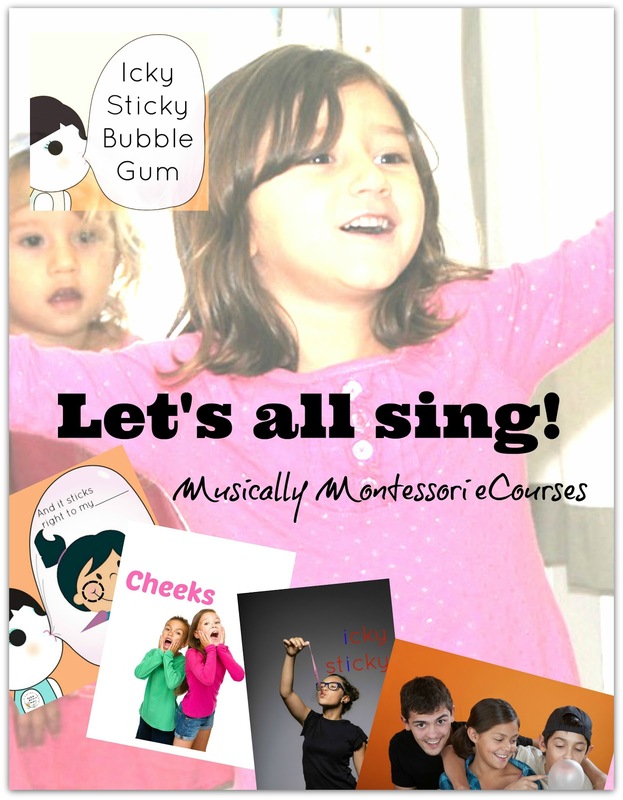 In this song: Language, vocabulary, and memory skills. ~1. Old Miss Sally likes to jump up & down, jump up & down, jump up & down! ~3. And, Old Miss Sally likes to bow. ~4. 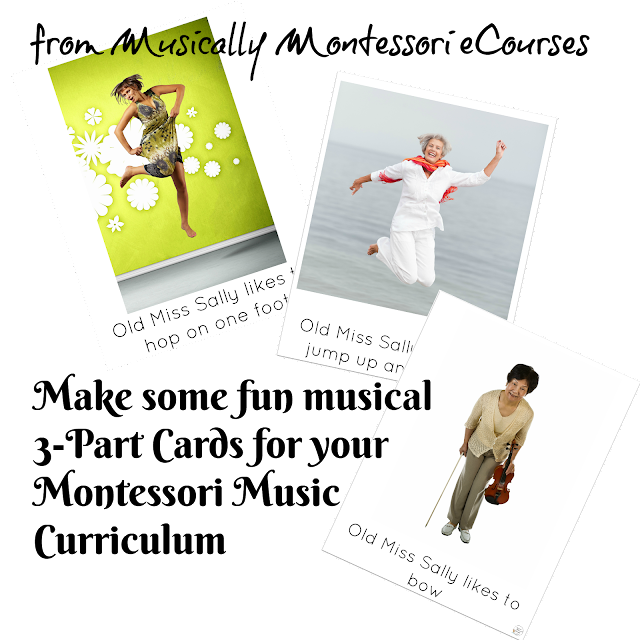 Old Miss Sally likes to hop on one foot, hop on one foot, hop on one foot! ~6. And, Old Miss Sally likes to bow. ~9. And, Old Miss Sally likes to bow! I've created a wonderful Lesson for this favorite song from my groups over the decades! You can access these activities and how to do them in my FREE eCourse, "Let's All Sing: 5-Day Challenge." 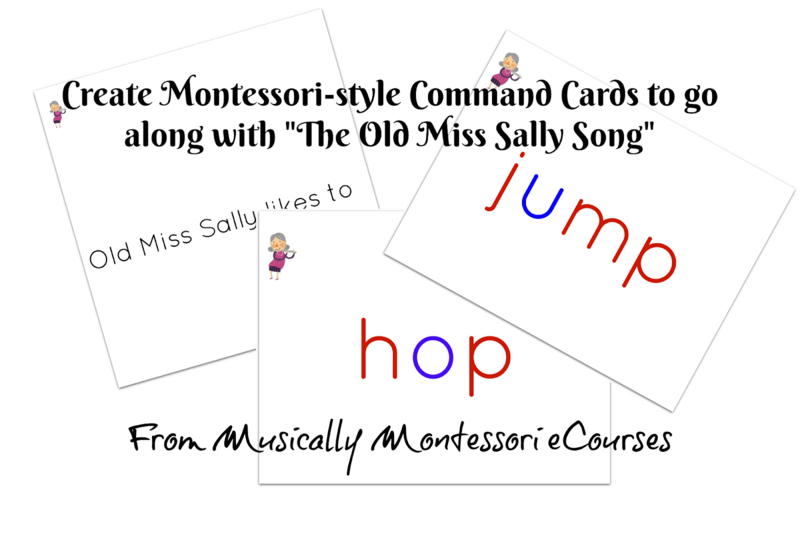 My groups always enjoy Movement Activities for the songs we love. "Old Miss Sally" is automatically a movement song! 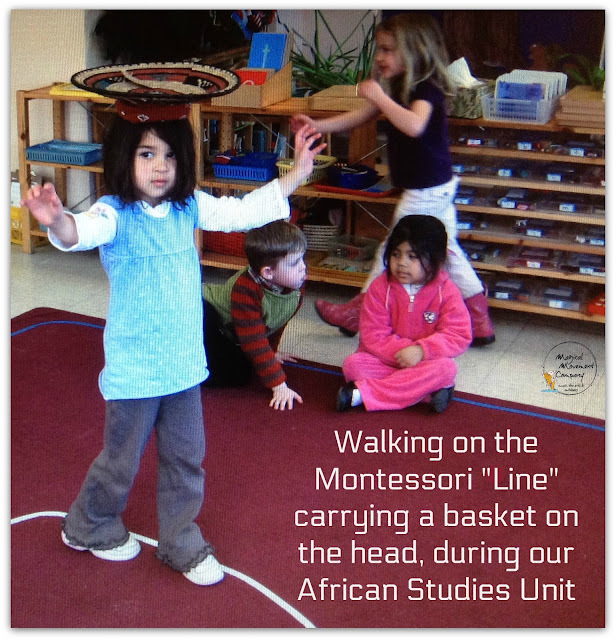 You can reinforce the fun of the movement with a classic Montessori-style shelf work for an individualized activity. Another classic Montessori individualized activity that is fun for reinforcing this song is a set of 3-Part Cards based on the lines from the song. 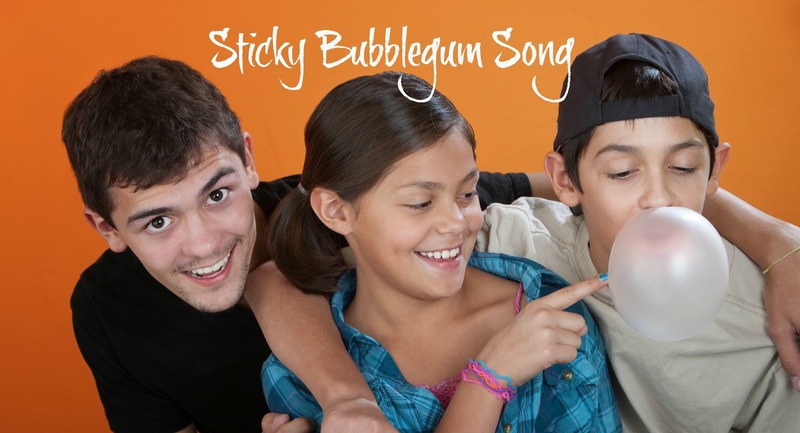 A great way to engage children in a fun way is to create stick puppets to go along with the movement activities in this song. You can make these up yourself, or create a shelf work for the children to make their own! 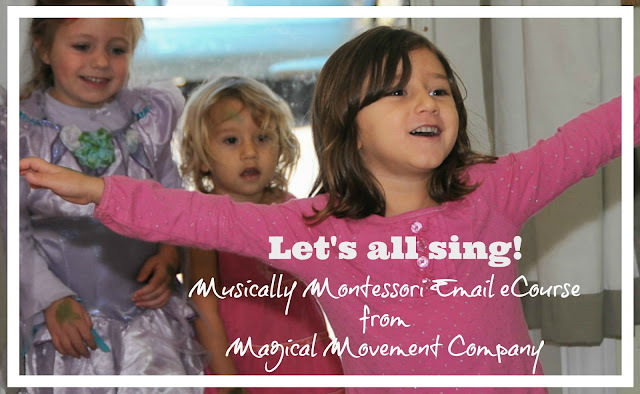 I invite you to join hundreds of other Montessori educators who have been enjoying lots of musical activities from my "Let's All Sing" Musically Montessori eCourses. 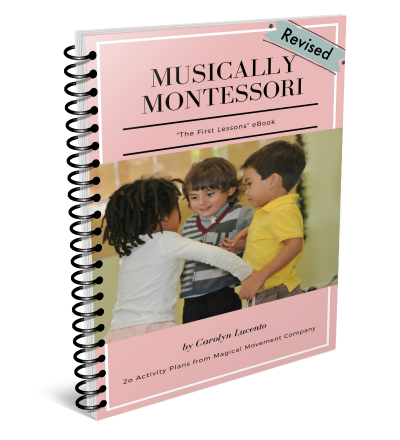 "My Montessori preschoolers loved this. Thank you so much for the idea ('Icky Sticky Bubblegum') and all the comprehensive materials you provided to prepare teachers to introduce this activity." from Sarah B. "This is great!!!! 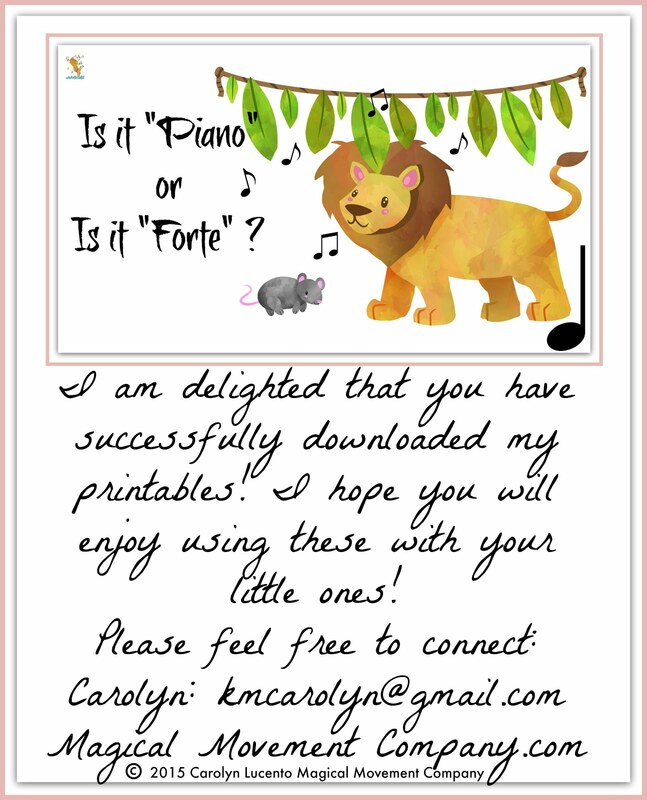 We've been singing 'going on a lion hunt' since you sent out the freebie and my kiddos love it! Thanks for all you do!" from Beth B. 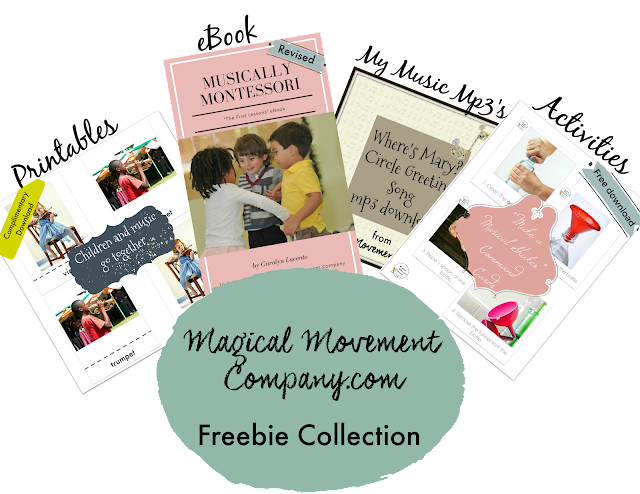 Looking for more FREE resources for musical fun with your little ones? Join my email list and you can access my 30+ freebies, including my eBook! 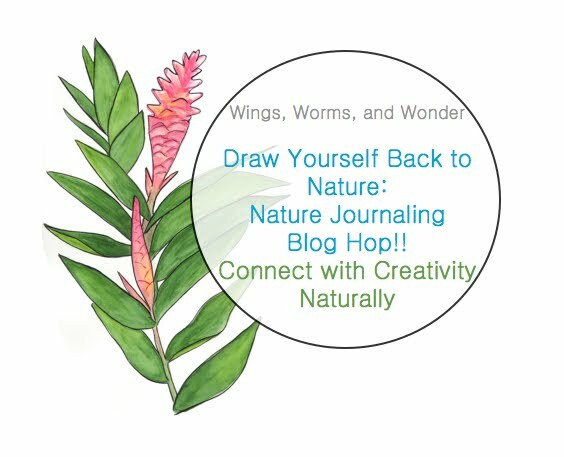 Sign up on the side bar of this blog, or scroll down to the end of this post if you are on a mobile device! Thank you very much for visiting my Blog today. 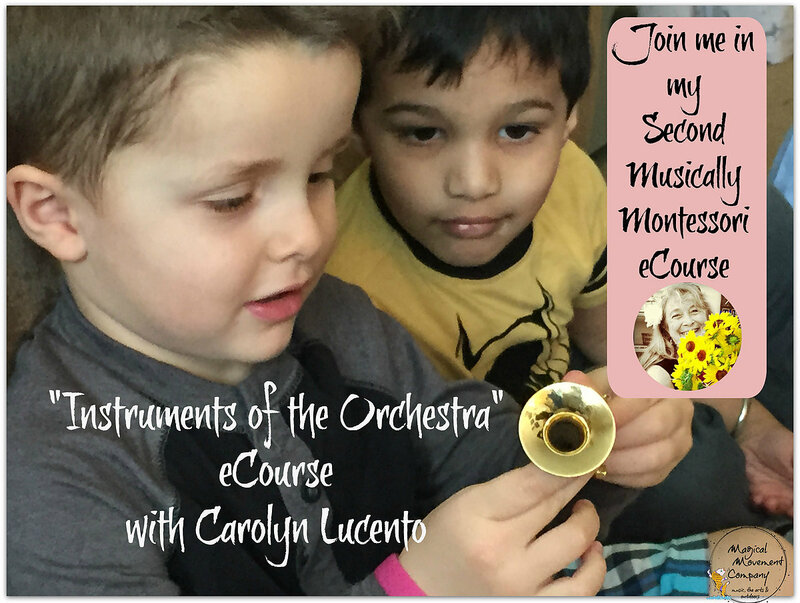 I hope you have gotten some fun music ideas for your little children! 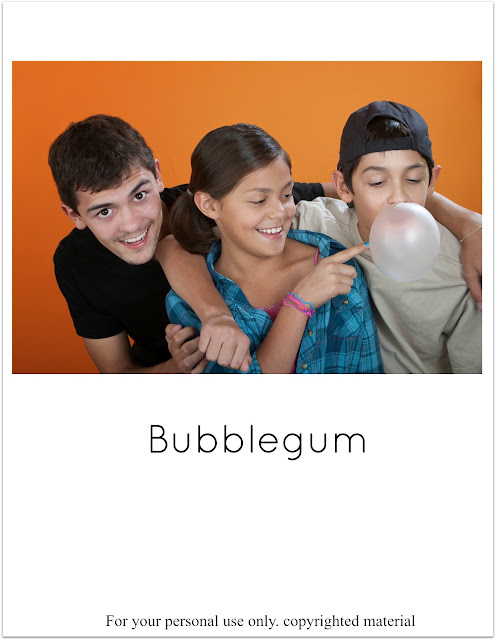 Photos in this Blog are from Adobe Stock, Depositphotos, and Magical Movement Company Archives. 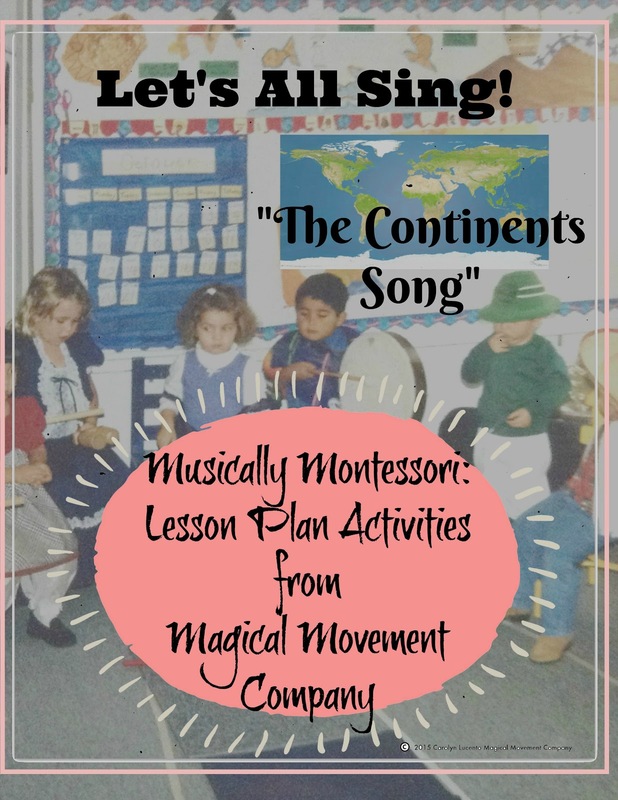 DO YOUR MONTESSORI CHILDREN LOVE SINGING "THE CONTINENTS SONG" AS MUCH AS MY GROUPS DO? Here are ten fun extensions for creating learning experiences through Music and The Arts. 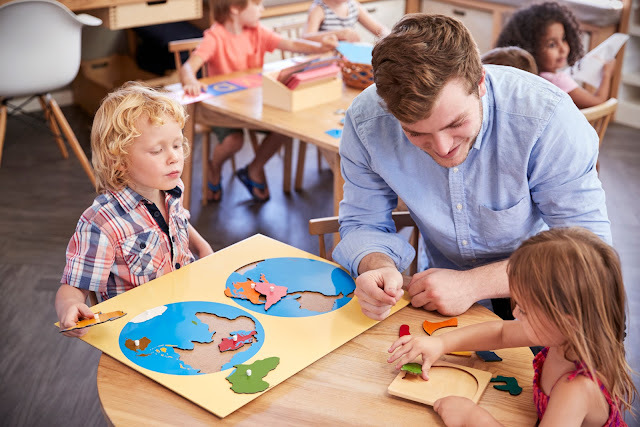 Fortunately, there are lots of materials in the Montessori pedagogy that lay a foundation for learning about the continents of the world through hands-on experiences with Manipulatives. There is the sandpaper land & water globe, the color-coded continent globe, and then the color-coded "Continents Map." 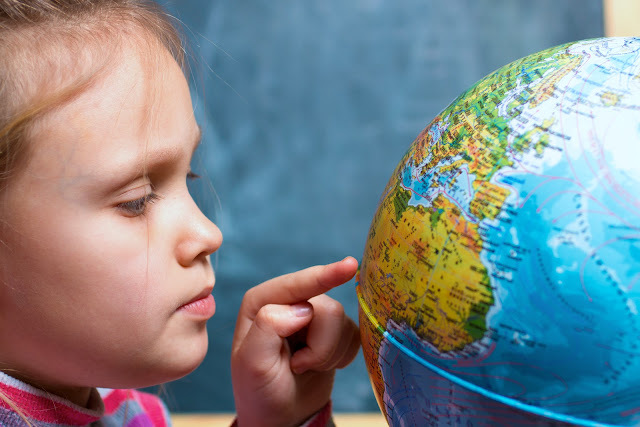 Even if you don't have access to all of the Montessori Cultural Studies Materials, you can still offer children a Globe and Visuals of a World Map. 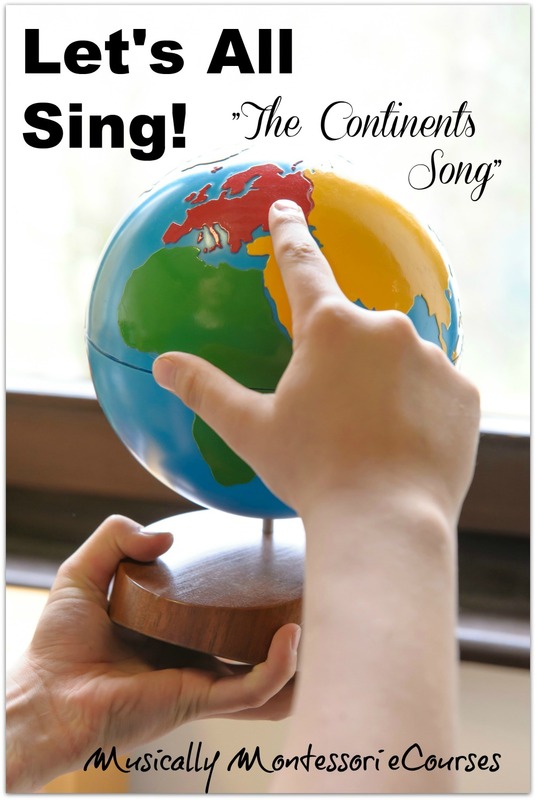 After the children have had lots of hands-on experiences with globes and puzzle maps, you can teach them "The Continents Song," while you point to each continent when its name comes up in the song. 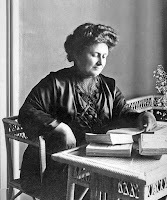 There are lots of versions of "The Continents Song" that you will hear in Montessori classrooms all over the world. My groups have two favorites: one that is short and one that is long! I always introduce the short version to the children first. 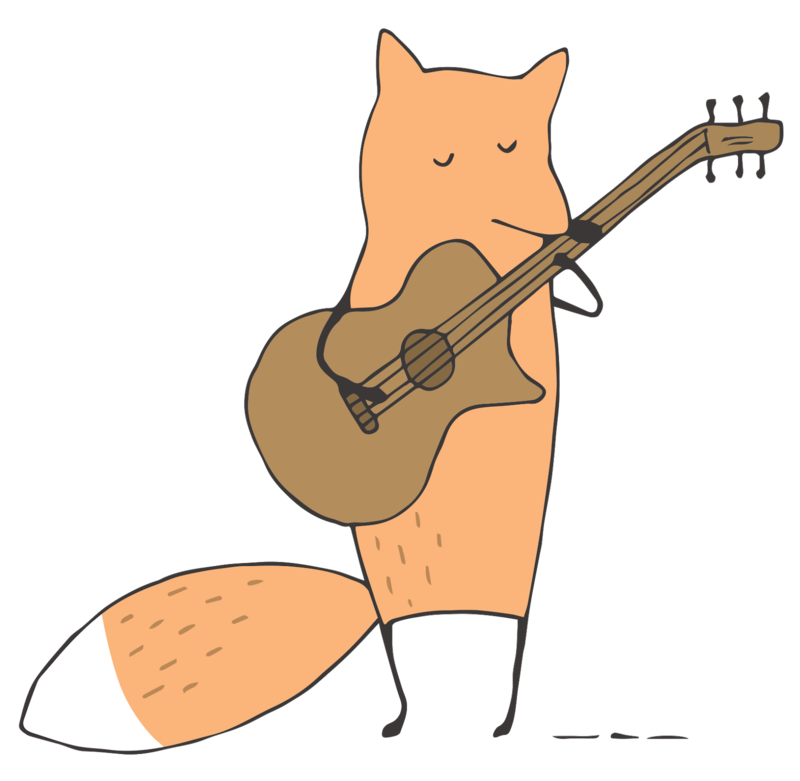 You can listen to my short version of the song at my Youtube channel HERE. 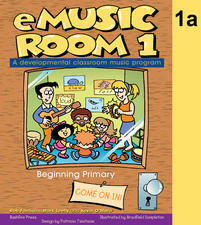 Eventually, you can introduce the children to the longer version, which is more repetitive and very fun rhythmically! Here's the YouTube video I created for the longer version of "The Continents Song." 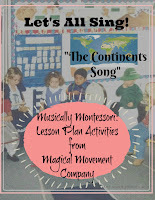 There are lots of fun musical extensions to reinforce the names of the continents of the world. One activity is to clap the rhythm of each of the names of the continents. 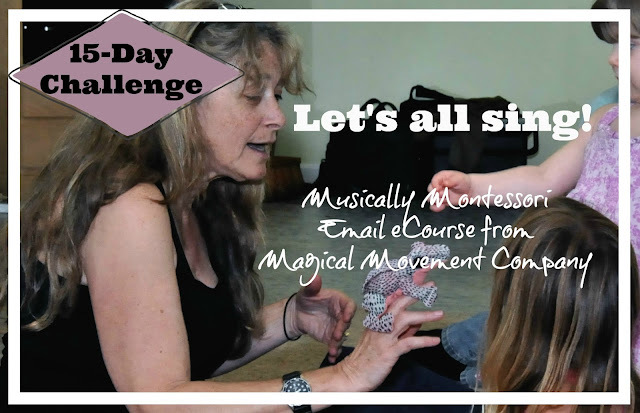 In Lesson #11 of my Musically Montessori eCourse, "Let's All Sing: 15-Day Challenge," you will be able to download a set of rhythm notation and recitation cards for each of the Continents. 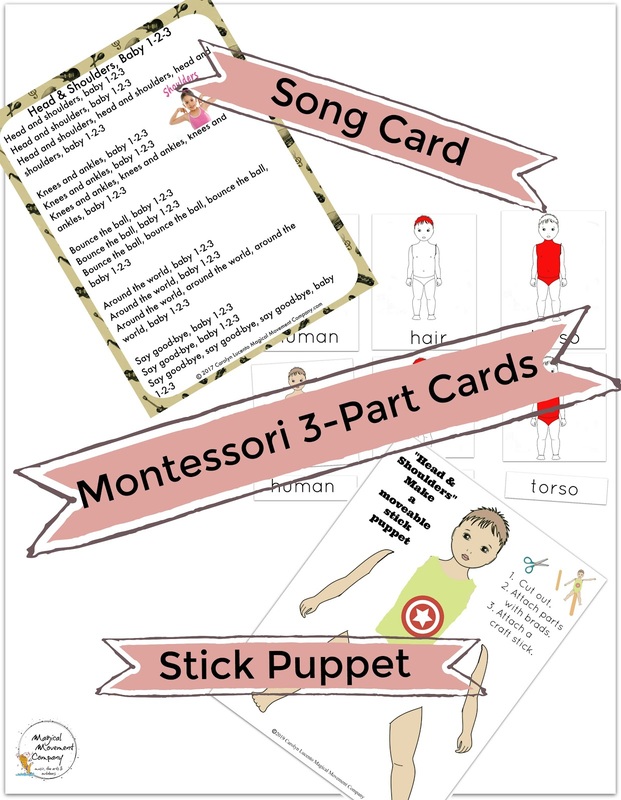 Picture Cards of rhythm instruments for creating a classroom "Performance"
Click here to learn more about the eCourse: "Let's All Sing eCourses." Give children baskets to carry, trays of tea cups, or flags for marching that reflect the lives of the people of your featured country or continent in your Cultural Studies Curriculum. Here's one of my Blog Articles about this activity: "Musical Story for Preschoolers to Enjoy a Walk to the River." 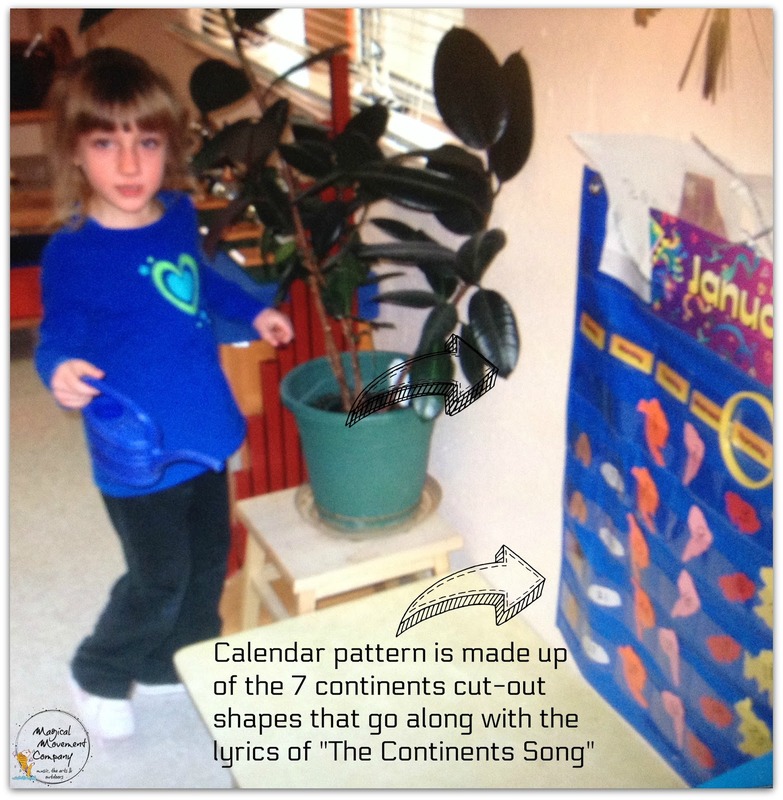 I traced each continent from the Montessori Continents Puzzle Map, on color-coded paper, and then made calendar inserts, enough to create the pattern for the days of the month in which I first introduced "The Continents Song." You can sing the Short Version of the Song each morning so that the children can predict what comes next in the pattern. from the Country or Continent being Featured. 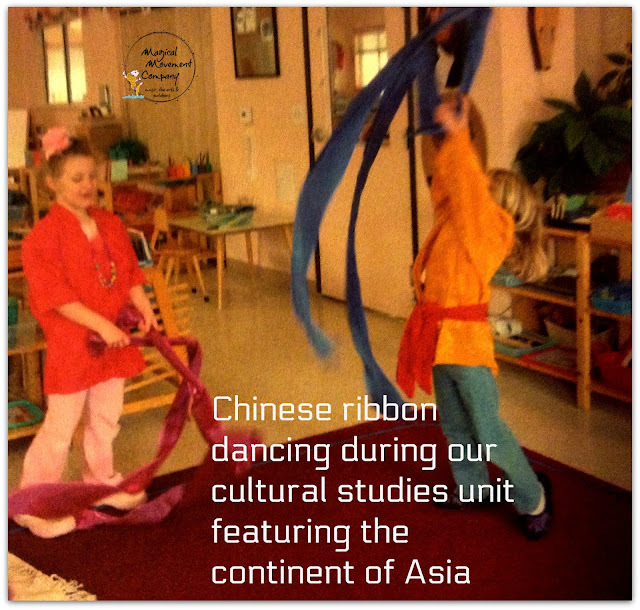 Providing long ribbons for children to dance the Chinese Ribbon Dance is a fun way to celebrate the continent of Asia. Put on some lively traditional music of China and invite the children to dance! "Celebrating Chinese New Year with Ribbon Dancing for Little Children." This is a picture of children walking on a balance beam in our Drama Play Story of the "Alligator in the River" during our Cultural Studies of Africa. 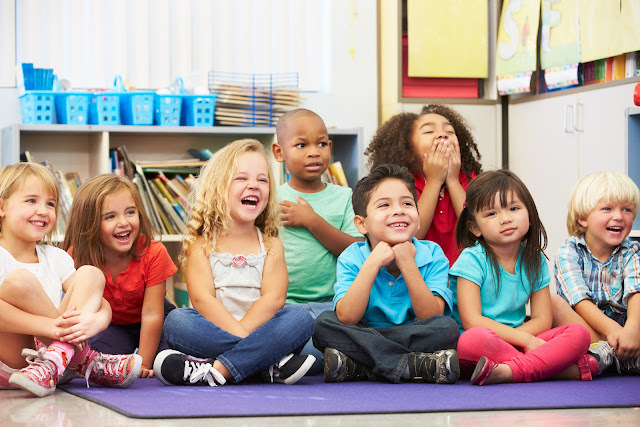 You can create stories for children to dramatize with Movement Activities, props, child-made stick puppets, masks, or with rhythm instruments that feature the country of study. 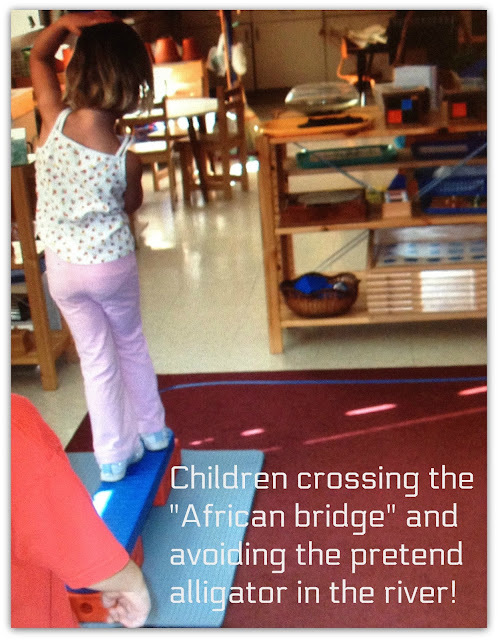 ~ "Little Children in the Rainforest"
~ "Africa-inspired Balance Beam Fun: Crossing the Bridge at Alligator Alley"
As you introduce each of the continents in more depth over the months, you can set up a fun station for creating "Sandpaper Continent" cards. My groups have always greatly enjoyed this activity! Provide a tray with pieces of cardboard, a pencil, glue stick, and colored sand in a shaker bottle. The sand is color-coded for each continent. The child chooses the continent to work with, then fetches that puzzle piece from the Montessori Continents Map. Next, the child traces the shape of the continent on a piece of cardboard. Then, s/he fills in the tracing with glue. Now it is time to shake the sand onto the glue-filled shape. 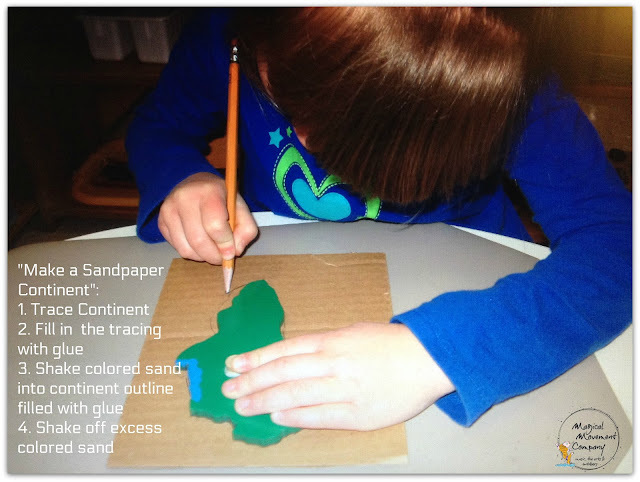 After, the child has filled in the shape with the colored sand, then s/he can pour off the excess sand into a container to save for art projects. Finally, the child (or teacher) can write the name of continent on the card. 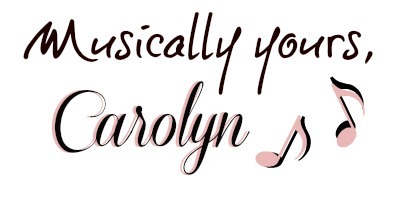 ~ Have you joined my mailing list? 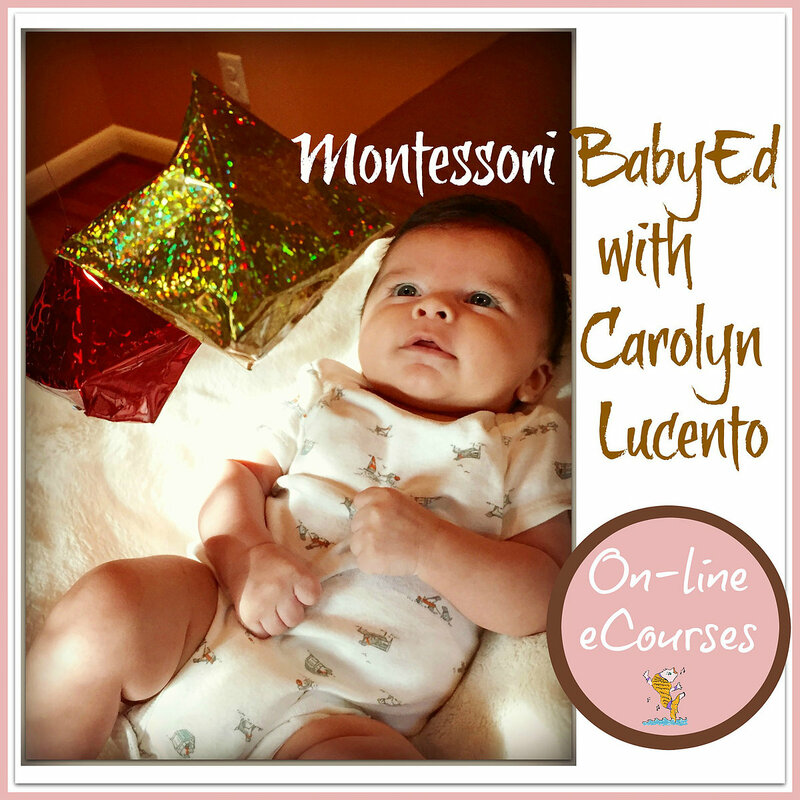 My subscribers have access to my 30+ free resources, including my "Musically Montessori First Lessons eBook." 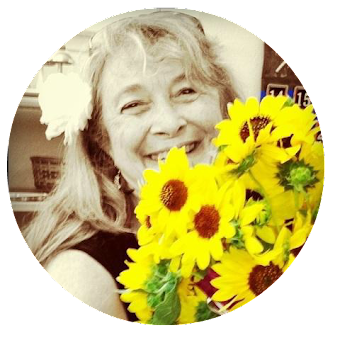 You can subscribe on the sidebar of this blog or scroll down if you are on a phone or tablet. I'm happy to see you here at my Blog today. 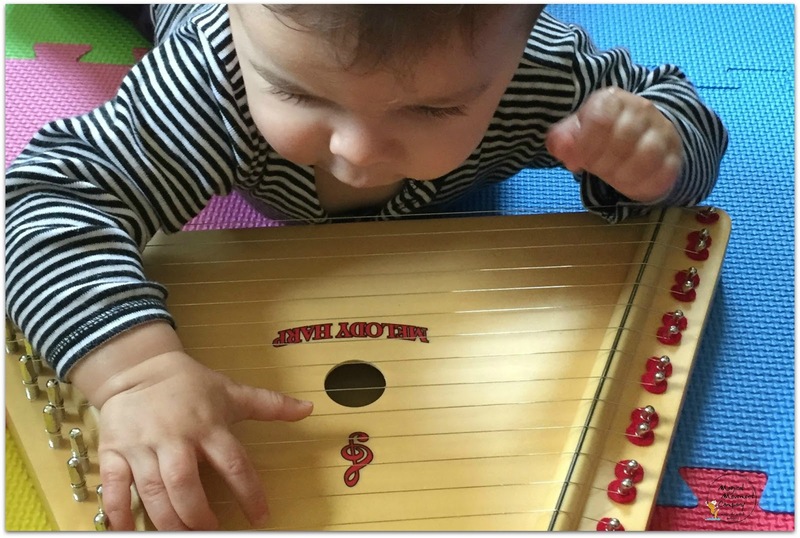 I hope you have gotten some musical ideas for your children!